I yet have to come across someone who doesnt like piping hot crispy pakoras at any time of the day! The english call it “onion baaji” and is the number one starter for them! They are also known as “bhajiyas” and for us sindhis we call them “sana pakoras”. Well today i have a twist to our “sana pakora”!! Recently i was invited for a “pint and pakora” event.. me providing the pakoras and the cafe providing the pints of beer! It was a lot of fun watching the spanish drool over pakoras. Again i state, i have not come across anyone who does not like pakoras till date! Wether they are hot from the kitchen or left for a few hours , this makes an excellent snack for travellers or a picnic dish. Serve it with ketchup, or a green or red chutney and your done ! I am always experimenting in my kitchen trying to create different flavours for my food. 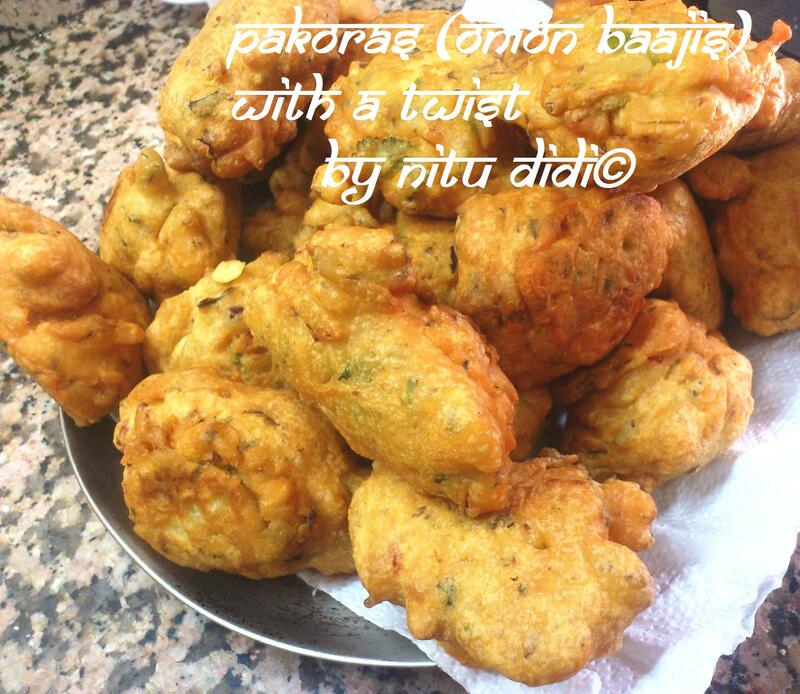 Today i am sharing with all of you my recipe of crispy , non oily pakoras with a “twist”! This recipe will be written in steps. 1. Cut all the vegetables and put them into a big bowl. Add the seasoning and spices. This can be done a few hours in advance if you want to save time. 2. When you want to make the pakoras heat oil in a deep fryer or a “kadai”. Let it heat on medium heat. 3. Add the gram flour (besan) to the mixed vegetables together with the rice flour. 4. When the oil is hot , add the sparkling water and baking powder to the vegetable/flour mixture and make a thickish spoonable batter. Please watch my youtube video on pakoras to have an idea. 5. Lastly add a tablespoon of hot oil into the batter and mix well. 6. To test the temperature of the oil : i just put a tiny teaspoonful of the batter into the oil…if it rises slowly means the oil is ready. To see this proceedure please go to my youtube video. 7. Put spoonfuls of this batter into the hot oil taking care not to put too many at the same time into the oil as they will not cook well. You will see how they puff up while frying. Fry them till golden brown and then drain well. Serve with chutney or sauce of your choice. Enjoy this lovely desi snack which is so popular worldwide ! You can also add chopped spinach leaves, a teaspoon of dried fenugreek leaves, some grated carrots, some grated potatoes etc etc to this batter. To get different flavours i suggest you add different vegetables so that each time it tastes different! This entry was posted in Breakfast, Everything Vegetarian, Floury Matter, Fusion, Gluten Free, Indian Restaurant Dishes, Quick Recipes, Recipes with videos, Veg Starters, Vegan. Bookmark the permalink.